Y’all know I’m usually all about making a recipe your own and substituting what you have on hand for what you don’t. With this recipe for Italian Cream Cake, though, if at all possible, I strongly encourage you to stick as close to my ingredients list and instructions as you can. Make a trip to the grocery store if need be because the end result is more than worth it! This is the perfect cake for any special get together: Thanksgiving, Christmas, Birthdays, or “Just Because”. Whenever you make it, you’ll most certainly be required to make it again as the question will arise “Is Grandma/Aunt/Sister making her Italian Cream Cake this year?” so get ready to start a new tradition. Why is this cake so special? Well, it’s tender, light, moist, and filled with a flavor you can only get from a special “from scratch” Italian cake recipe. Fortunately, though, there isn’t a lot of fuss involved so there is nothing to deter you from adopting this as your signature special occasion cake. Not that I’m hinting at anything…. To make this amazingly wonderful cake that your family and friends really and truly deserve a chance to enjoy, you’ll need: All Purpose Flour, Sugar, Whole Buttermilk, Solid Vegetable Shortening (such as Crisco), Baking Soda, Butter, Eggs, best quality vanilla you can find**, and coconut*. If you are in this group of coconut haters, you *could* leave the coconut out. I would never, ever, ever, ever do such a thing as it is such an integral part of Italian Cream Cake for me but if you just have to, I’m not gonna stand in judgement. Free will and all that. Will it taste the same? Well no, because it won’t have coconut in it. So the main thing to decide is if not having coconut is going to be a benefit or detriment for you. 🙂 Then, you just do what you gotta do and don’t worry about other folks. I mean, we are the family who makes our Red Velvet Cake green so who am I to say anything? ** By “best quality vanilla you can find” I mean that just as I say it. If you open up your pantry and the best you can find is imitation vanilla, well then use it. If you have this amazing vanilla that you buy in Epcot from time to time so you shelled out the moolah for it because it smells like sugar cookies and love, then use that. Place butter, shortening, and sugar in a mixing bowl and beat with an electric mixer until well combined all fluffy, or fluffified. Please please please please please make sure your cream cheese and butter are room temp in this recipe. You know how I tell y’all not to fret over little details like this in most of my recipes? Well, if I tell you it’s time to get particular, get particular ;). This is an easy one to do, though. I just set my butter and cream cheese out as soon as I get up in the morning so they are room temp by mid to late morning, and then bake it. Add your eggs. Two eggs I cracked for this had double yolks! It’s the little things that thrill me :). 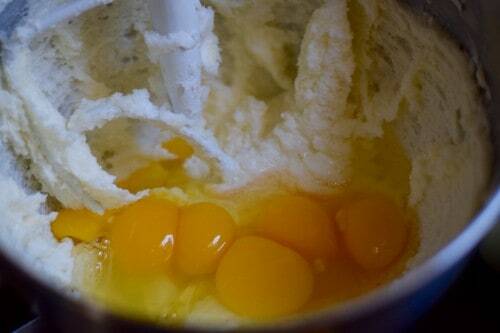 This recipe calls for five eggs but if you see more than that here it is due to the double yolks in a couple of them. I still go by the size of the egg rather than how many yolks are in it. My little hens made me proud with these! Beat those in real good, scraping down the sides as needed. Already, this batter is like a rich, smooth velvet, but it’s about to get even better. 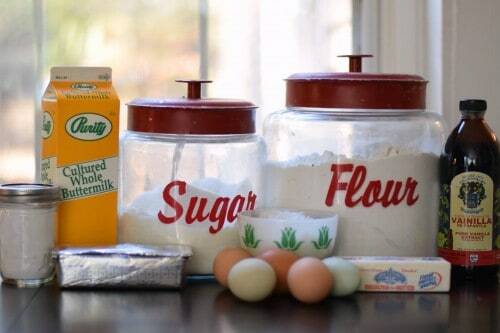 Stir your baking soda into your flour. Add flour mixture and buttermilk and mix until well blended, about a minute. 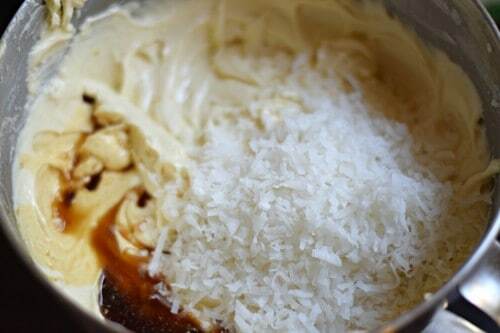 Add in coconut and vanilla and mix again until incorporated and batter is nice and creamy. 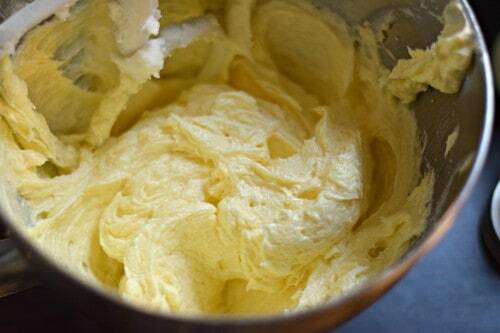 Oh what lovely batter this is! 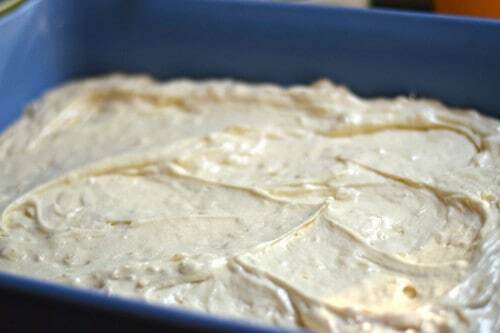 Spread batter into greased 9×13 pan. If you want to get fancy you can make this in two 8 or 9 inch round pans but I mean, we have already made this cake from scratch and I’m just a 9×13 girl unless someone is getting married or turning 16 so…. Bake this at 350 for 40-45 minutes, or until a toothpick inserted in the center comes out clean. If you are baking it in round pans it will bake for about 25-30 minutes but you’ll need to keep an eye on it and still test for doneness. Once it is done, let it cool completely and then make your cream cheese icing and top off the cake, recipe below. Cover with foil or cling wrap to keep it airtight until serving time. ENJOY this cake, and enjoy watching everyone else enjoy it, too! This cake is in my top ten favorite desserts of all time. It’s pillowy soft, moist, and just all around perfect. 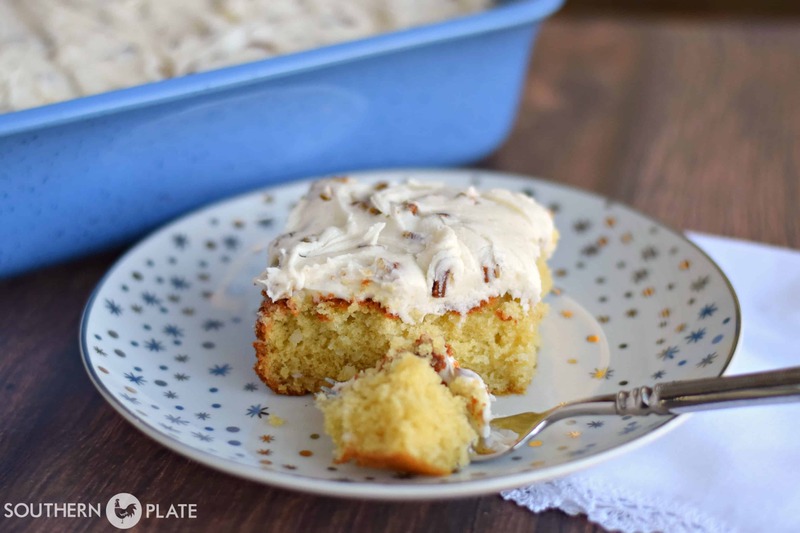 Top it with a pecan studded cream cheese icing and you’ll bring back an empty pan every time. Preheat oven to 350˚F. Grease a 9x13 pan by spraying with cooking spray and set aside. 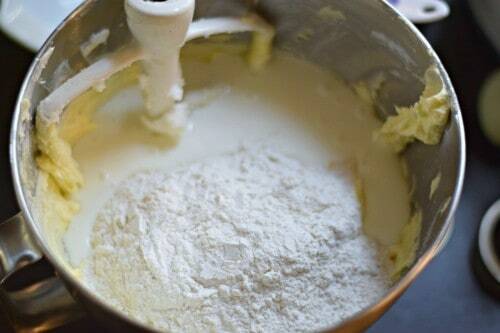 In large mixing bowl, use an electric mixer to cream together shortening, butter, and sugar until light and fluffy. Add eggs and beat well until smooth, scraping sides as needed, about two minutes. In separate small bowl, stir together flour and baking soda. Add flour mixture and buttermilk to the egg mixture and mix until well blended and completely smooth, about two more minutes. Add in coconut and vanilla and mix until well incorporated. Pour into prepared pan. Bake at 350 for 40-45 minutes or until toothpick inserted in center comes out clean. 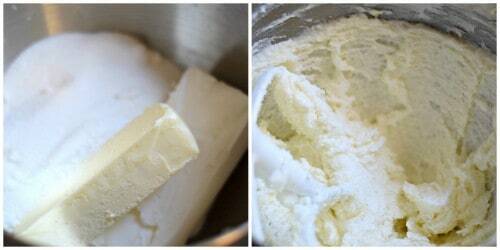 Place cream cheese and butter in mixing bowl and beat with an electric mixer until fluffy. Add favorings and about half of sugar and mix again, scraping down sides as needed, until sugar is well incorporated. Add remaining sugar and mix until a nice fluffy icing is formed, again scraping down sides as needed, about one to two minutes. Mix in pecans. Ice cooled cake. Store this cake, well covered, in the refrigerator for up to a week or at room temp for up to two days. Looking for Thanksgiving Recipes? Click here! Could you make this with coconut oil instead of shortening? The melting point of coconut oil is lower than that of shortening so I can’t tell you that it would turn out the same. Okay, mainly I can’t tell you that because I’ve never tried it ;). So you’d be going rogue but you might be pleasantly surprised with the results! If you try it, please report back either way! I use coconut oil on a regular basis, many times grabbing it before anything else. With that being said, I haven’t tried it yet…..BUT…… I’d be surprised if you’d have a problem. I would think it would add an additional flavor to the cake. Christy, I just discovered your website and wanted to tell you how much I like it! I love seeing the pictures and the comments you make as you describe the steps of a recipe, but I love even more that at the end of each recipe, you provide a copy that I can easily copy and save on my computer. Thank you! Hey Nancy!!! Welcome to Southern Plate!!!! I’m thrilled to death to have you here and you are going to be a wonderful addition! Thank you so much for joining us and for the sweet words! Please holler if you ever have any questions and chime in as often as you can in the comments! Two questions, do you have to use all purpose flour and baking soda or can you just use the self rising? Does it make a difference? Also do you use the Crisco type shortening in a can or can you use liquid? Thank you so much. My family is eating much better because of you! 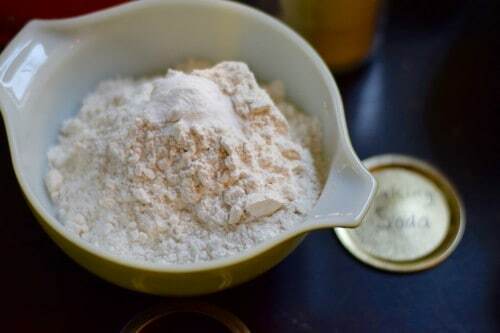 The general formula for making your own self rising flour is 1.5 teaspoons baking powder and 1/2 teaspoon salt per cup of all purpose. So in this recipe that would be adding 3 teaspoons baking powder and 1 teaspoon of salt whereas we are just using 1 teaspoon baking soda. You can certainly try subbing self rising (I do it in many recipes myself and just cut out the salt and baking powder) but in this one I always stick with my original recipe. This cake is definitely worth a trip to the grocery store 🙂 You do need to use solid vegetables shortening as well, not vegetable oil. I know I am usually not this particular with my recipes and I do apologize! I promise this one is worth it! Thanks so much and y’all have a wonderful Thanksgiving! Good to know, Christy. Having my first cup of coffee this morning and wishing I had a piece of this cake to go with it! Merry Christmas, Everyone! My only beef with coconut recipes is that most of them don’t have enough. 8) I usually add more. My family loves coconut. Except for my father. But that left more for us. I usually made him something else when we had something coconut. The only problem is I’m going to have to leave the pecans out, or use pistachios. A test cake prior to my niece and her husband coming in January will work nicely. Half with pistachios, half without. Thanks, Christy! And Happy Thanksgiving to you and all of your family. I **REALLY** like pistachios! Happy Thanksgiving to you and yours, too!!!! Christy: I finally tried your Italian Cream Cake with pistachios instead of the pecans. I only made 1/2 of a cake, as I didn’t need a whole one. It turned out well with the pistachios, and they would certainly be an acceptable substitute for pecans. I do think the pecans are more flavorful though, and I would prefer the pecans to the pistachios, but that can’t be. I only added the pistachios to 1/2 of the frosting so that I could try it both plain, and with nuts. I like the contrast between the cream cheese and the coconut better without the nuts, and even better than with a sprinkling of coconut on top of the frosting-who’d a thunk it? I almost always add more coconut to recipes. I think this is the first time that I haven’t done so. My only complaint with coconut is that at my grand age it gets between my teeth! Everything’s better with pecans in it!! You are so right about the pecans! I feel like I’m using golden nuggets for what I pay these days, though :). And teeth, oh goodness that is an issue for me as well. Christy, oh my, I will have to make this one for sure… too late for me for Thanksgiving but I’m now thinking Christmas! 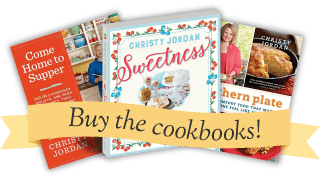 Love your stories and recipes. Have a wonderful Thanksgiving! Thank you so much Nancy, I hope you have a very Happy Thanksgiving!! Hey Christy: The Italian Cream Cake is my #1 favorite cake of ALL TIME. My family always made these and I have made them for co-workers bdays. Even one of my co-workers who says she doesn’t like coconut loves this cake. I put pecans in the batter and cherries. One main difference I noticed was how you did the eggs. My recipe you separate the eggs and beat the whites then fold them in last. I’ve often wondered if it really makes a difference. Tell me about that and what you think? I’ve never tried making it , by just adding the eggs whole. That would definitely make it a little faster and less fussy. I hope you and all your family have a Happy and Blessed Thanksgiving. I have never made it separating the eggs, I am not sure how much difference it would make but if you try it this way I would love to hear what you think. Wouldn’t separating the eggs, beating the whites and folding them in at the end make for a fluffier cake? I would imagine so. My original recipe instructs to separate the eggs and fold in the beaten egg whites last. It makes it moist and light. Italian cream cake is one of my favorite. Use to make these fairly often – always in 3 layers. Made it for work once, not a quick dump cake. A coworker took one bite, said it was one of the best cakes she had ever eaten, wanted to make one, then proceeded to ask me what brand and flavor of cake mix and icing. I was flabberghasted right before I chased her out of the office. No more cakes for her!! Will have to try it in the 9 x 13 pan. Thanks for the reminder! Thanks for this wonderful cake Christy. The first time I taste this cake, was when a co-worker brought it to our Annual Christmas Dinner, my goodness, I thought I had died and went to heaven. Thanks once again. Have a Wonderful Thanksgiving! Thank you Annette, I hope you have a wonderful Thanksgiving as well!! Thank you Christy! I am going to try this cake this weekend after Thanksgiving as I have been requested to make a red velvet cake for my hosts birthday. I will be bringing your sweet and sour green beans as well as mashed potatoes! Happy Thanksgiving to you and your lovely family! Sounds like you have a wonderful celebration planned! Hope you have a very Happy Thanksgiving!! Italian cream cake was my husband’s birthday request this year. I love that you make yours as a sheet cake…I adapted a layer cake into a sheet cake for his and I was so glad I did. Sheet cakes = easy one-pan simplicity = happy baker! Sheet cakes are so easy!! He made a good choice for his birthday cake!! Hi! We are coming to the cooking class Thursday!! Yay!! How do we get our tickets? Thank you! Can’t wait to see you!! Hey! As long as you registered you are good. I will send out an email on Monday with more details of what to expect. Look forward to seeing you! I have to leave out any and all nuts because of my son’s allergy. Do you think this cake will be ok without them or should I just find something else to make? Please feel free to leave them out and have a wonderful Thanksgiving with your precious son! Ooooh, gotta try this one! Christy, you referenced in your post about buying vanilla in Epcot? Where in Epcot do they sell vanilla? I figure it would have to be back in the ‘Countries’ section of the park, maybe the Mexico section? I don’t know if you were making a joke or if you were serious, but I have to admit if it were true, I think that is where some of my souvenir money would be spent – Hehe! I hope you and your family have a wonderful Thanksgiving! You can make your own with Madagascar vanilla beans and a good white rum. I won’t ever buy it from a store again. Can’t beat the quality, and it’s how they did it in the old days…(Little House on the Prairie books). Your blog begs the question: What are the other 9 favs? Hi Cheryl, I wasn’t sure what Copha was so I looked it up and either would work. Just use whichever you tend to keep on hand. Well, the cake part is currently in the oven. Out of coconut (boo), but one of my kiddies doesn’t like coconut, so it’s ok. Used regular milk rather than buttermilk (wanted to have for dinner tonight, so had to skip that part). I make my own vanilla from scratch, so no imitation shtuff here! Super psyched to try this out, and thanks for the Bible verse at the bottom. It is a blessing to see and remember! I also use frozen coconut. It seems to make the cake moister. Now this is one cake that I will be making soon. I think that is a wonderful idea Colleen!! I have just made this cake, and it will get eaten tonight by us and our guests. It already smelled delicious and I tried both the icing and the dough. It’s heaven! The good thing is, I live in Switzerland and got all the required items from the receipe in our local store (Coop Megastore, for my fellow citizens). Will post again after we ate it . I am so glad you were able to find all of the ingredients Sandra!! I know that with some things folks over-seas have a hard time finding them or a substitute. I hope you and your guests enjoyed the cake!! I’m under doctor’s orders to watch my sugar intake, so when I do eat dessert I want it to be special. I made this cake today. I ate two pieces, and will probably have another this evening. My doctor is going to kill me. I’ll die happy. LOL. John, you are going to get us both in trouble! !